Leading Manufacturer of modular mezzanine floor and mezzanine flooring systems from Mumbai. 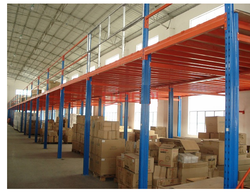 Owing to our rich industry experience, we are engaged in offering Modular Mezzanine Floor. Our mezzanine floors are suitable for diverse storage needs like light, medium and heavy storage. These mezzanine floors are rigorously tested by our quality experts against diverse parameters so as to supply a flawless range. 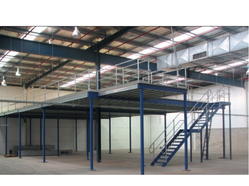 Customers can avail these mezzanine floors from us at affordable rates in a given time frame. Backed by a team of highly skilled and experienced professionals, we are engaged in offering Mezzanine Flooring Systems. This flooring system is checked by our quality experts so as to supply a perfect range. Our skilled professionals develop this flooring system by making use of top-notch material keeping in mind the predefined standards. Our valuable customers can avail this flooring system from us in varied specifications at industry leading price. Looking for Modular Mezzanine Floor ?